Quickly chop, dice, and mince fresh produce into uniform cubes, even if your knife skills aren't so sharp. Ideally, dicing produce results in uniform sized pieces in a neat pile, with all your fingers still attached. TV chefs, knives flitting around their onions and tomatoes, make it look easy. But without months or years of training and practice--not to mention expensive, frequently-sharpened knives--it's not. With our 3-in-1 Produce Chopper, a cook needn't be a knife skills ninja. 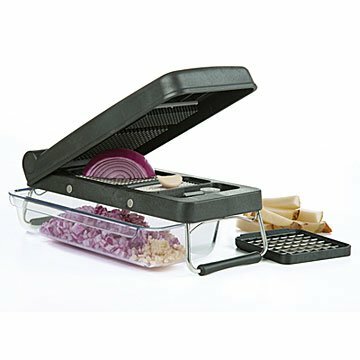 Three sizes of gridded blades (for chopping, dicing, and mincing) swiftly and safely handle your produce, dropping the neatly cubed pieces into the 3-cup capacity attached bin. Durable and dishwasher safe, it makes cooking fresh produce much less of a chore, which means you'll do it more often--with all 10 fingers intact. Made in China. We put this product to the test! Find out how well it tackles complex cuts on our blog. See below for component measurements. Very nice and solid looking, and clever design, but it doesn't work well. The top just doesn't push onion or garlic all the way through. I tried several times with both onion and garlic but was always left with a clump of unchopped veggie on the top that I had to push through.I cut myself doing this and the pusher fell apart after second use. Also hard to clean. The onion part comes out but not the garlic and pieces get stuck in the top part as well as the chopping blades. Too bad. I was hopeful this would be a great time- and tear-saver. I really wanted to love this item, as I cook daily and use a lot of vegetables which is exhausting to chop. I thought this item would be perfect. It turned out that it did not meet my needs. It was hard to press down to cut the vegetables even when I cut them down smaller. I thought for $50 this must be a miracle worker, but I was left disappointed. Would not recommend! Make a lot of green chili recipes and this makes the vegie prep work much faster. Solid lid and hinge points, easy clean, minimal pieces, really enjoy this. Fantastic tool in the kitchen to have!!! I want to buy this for my 4 grown children!!!! I know they will love it, and use it all the time!! This is a FANTASTIC product!!!!! It is sooo easy to use. Fantastic product!! I love it!! !